For the first time ever, a German team of physicists has observed the race of two electrons that are liberated from atoms in the course of photoionization, i.e. under the influence of laser radiation. In order to resolve the electron’s movement during only 50 femtoseconds, scientists from Hamburg and Kiel Universities and DESY (Deutsches Elektronen-Synchrotron – one of the world's leading accelerator centres) used an ultra fast terahertz streak camera in combination with a free-electron-laser. The experimental findings will improve the rapidly evolving free-electron-laser technology used in many fields of science – from physics to biology. The results are published on June 20th in Physical Review Letters. The interaction of electrons is crucial for the properties of atoms and molecules which are the building blocks of living organisms and all man-made systems. Understanding the electronic processes in atoms is therefore essential for numerous future applications – from medicine to engineering. When a photon of sufficiently high energy hits an atom it may kick out an electron. Albert Einstein termed this process “photo ionization” (photo effect) back in 1905 and thus confirmed a theory of the Kiel scientist Max Planck that would soon revolutionize physics: quantum mechanics. Quantum mechanics predicts that the liberated electron runs away from the atom, behaving like a wave. In the 1920s, Lise Meitner and Pierre Auger independently discovered another effect: When applying specific photon energy during photo ionization, a second electron, termed Auger electron, may be liberated from the atom. In cases when the Auger electron runs in the same direction as the first electron a quantum race of electron waves starts. This race of the two electrons is extremely fast, taking between 1 and 100 femtoseconds (1fs=0.000 000 000 000 001s). “Until now, no experiment has resolved this race in time”, says Professor Markus Drescher of the Institute for Experimental Physics at Hamburg University, leader of the experimental part of the project. The key to observing the electron race in the current study was to combine the free-electron laser FLASH at DESY in Hamburg with an ultrafast streak camera. By accurately controlling the timing of the two electromagnetic fields generated by the laser and the camera, the scientists were able to reconstruct the electrons’ movement and energy exchange. In this manner, the physicists detected how the Auger electron passes the first one. At the Institute of Theoretical Physics and Astrophysics of Kiel University, the research group of Professor Michael Bonitz tried to reproduce the experimental results with computer simulations. 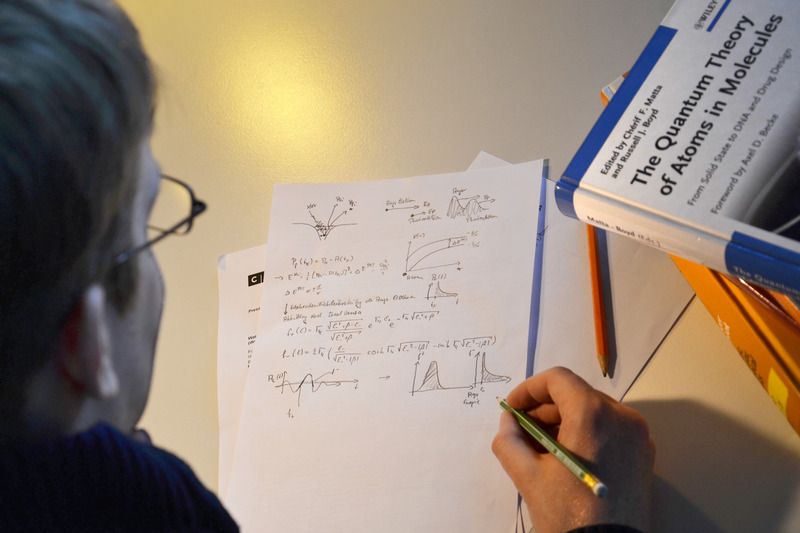 “After testing several possible explanations for the measured results, our PhD student Sebastian Bauch verified that the experiment indeed observed the quantum race of two electrons”, adds Bonitz. The Kiel physicists collaborate with the experimentalists from Hamburg within the project “FLASH” funded by the German Federal Ministry of Education and Research. The results give valuable information on key properties of the involved laser pulse. The free electron laser technology has been rapidly evolving in recent years. In this context the present results will be important for improving the quality and precision of future free electron laser experiments. Caption: Over the shoulder: Sebastian Bauch calculates the quantum race of electrons. 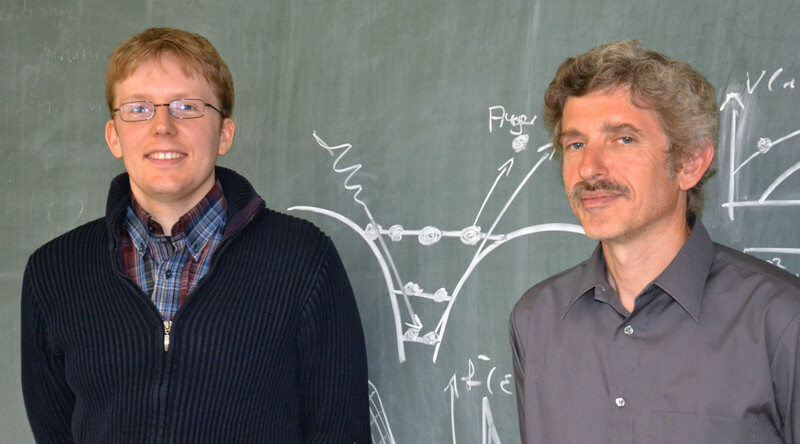 Caption: Theoretical physicists Sebastian Bauch and Prof. Michael Bonitz of Kiel University provided a theoretical explanation of the measurements at the free-electron laser.